These light and fluffy fritters are bursting with flavor. Delicious served as an appetizer, an afterschool snack or a light meal. Preheat grill to medium high heat. In a small bowl, whisk together Pesto Sauce and mayonnaise until well blended. Cover and set aside. Brush chicken lightly with oil, and season with salt and pepper, if desired. Grill for 5 to 6 minutes on each side, or until cooked through. Transfer to cutting board and allow to cool. Cut diagonally into 1/2-in. thick slices. Slice the Focaccia bread horizontally and spread Pesto mixture onto top and bottom cut sides. 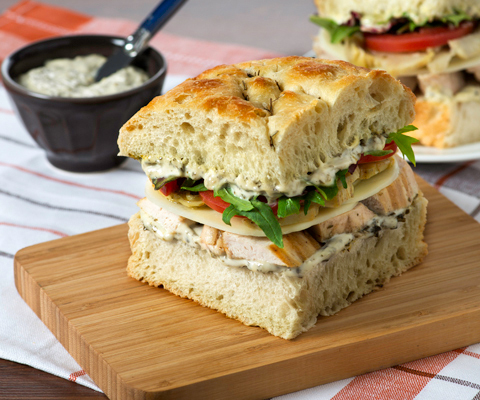 On the bread bottoms, layer the cooked chicken slices, mozzarella cheese, artichoke hearts, tomatoes and mixed greens. Place bread tops on and serve immediately. Just as delicious with Classico® Sun-Dried Tomato Pesto Sauce & Spread. If desired, subsitute mixed salad greens with baby arugula or baby spinach leaves.